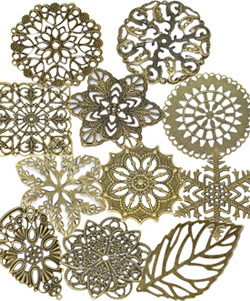 We know that many artists don't necessarily want a large amount of one specific charm, or flower style, or a batch of findings/headpins and embellishments. We have such a wide variety of items on our site that we can make it easy for you to get a wide variety of pieces, partz and ephemera, while saving 15-30% by taking advantage of our designer pricing and our special deal on shipping. Please feel free to email Myra with any questions. You're getting a $4 discount on your first order - **this page only** which lowers your shipping cost to $1.50! To order, please list each item number separated by a slash (ex: 1/3/5/6/7/8)... if this drives you nuts, just email Myra with your order. More than $40 of prime quality partz! More than $50 of prime quality partz! More than $65 of prime quality partz! Save even more with our pre-packaged "Mixins & Fixins"! More than $60 of prime quality partz! More than $70 of prime quality partz! Call this "the party platter"!